SIKO: “Increase system availability. Reduce setup times. Minimize waste. Ensure product safety.” These are the requirements for optimizing size changeover in production systems. Intelligent systems that make product changes faster and more ergonomic are in demand. The same applies to ZAHORANSKY, the worldwide full-range supplier for (tooth)brush production, packaging machines, mold construction and automation solutions. ZAHORANSKY has now integrated a monitored size changeover system, known as ERCO (Ergonomic Rapid Changeover), into the packaging lines for all types of blister packaging. This involves the electronic position indicators for monitored size changeover from SIKO, one of the leading manufacturers of industrial measurement and drive technology. The packaging machines that are equipped with the ERCO system are in the Z.PACK series. They are suitable for blister packaging of all types, for anything from stationery, tools, electronic items and automobile accessories to cosmetics and medical products. Each Z.PACK machine has various stations of different designs and lengths through which the blister packs pass during the packaging process. As Jörg Philip Zimmermann, Head of Product Sales Packaging, explains regarding ZAHORANSKY’s requirements for the packaging machines: “Our aim was to design the Z.PACK in such a way that the process would be reliable enough to eliminate operating errors and therefore waste and damage to the machines. 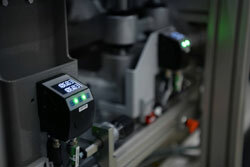 We also wanted to reduce the refitting times significantly and thus save money for our customers.” The packaging division was able to see how this could be possible through comparison with their colleagues in the brush machine business unit, where monitored size changeover in a brush machine with an electronic position indicator from SIKO has already been implemented successfully. The aim was to integrate this system into the Z.PACK packaging machines too. Compared to the brush machine, the distinctive feature in the Z.PACK machine is a result of the linear movement for which a monitored size changeover was to be implemented. The individual stations on the packaging line are moved in a straight line on two guide rails and must be repositioned precisely for each changeover. The ERCO concept already plays a part in this: thanks to the quick changeover system, the individual stations can be moved with minimum effort using your little finger. In order to ensure the process reliability still further, ZAHORANSKY has opted for AP10S electronic position indicators from SIKO with a linear magnetic sensor connected to them. This facilitates precise linear measurement of the manual slide adjustment on the guide rails. The bus interface is what sets the electronic AP10S indicator apart from mechanical variants. Thanks to bus integration in the position display, the process reliability required is achieved centrally via the machine controller (PLC). The PLC sends target values to the position indicator and reads the actual values measured. The target values are set up in a recipe management system within the machine controller, i.e. there is a recipe with all of the relevant target values, such as the station positions, for each of the products to be made. By means of the position status transmitted, the machine controller does not enable the entire system until feedback is received to confirm that all the positions set manually are correct, effectively preventing waste and damaged format parts as a result of adjustment axes being set up incorrectly. The distinctive feature is that the position status is displayed visually by means of LEDs: green for “Position correct” and red for “Position not correct”. This provides the operator with immediate and clear information about whether the station in question has been positioned correctly or readjustment is necessary. The external magnetic sensor for determining the correct position measures extremely precisely with an absolute accuracy of up to +/- 35 μm. Only when all of the LEDs turn green following adjustment can the packaging machine be put back into operation. The Z.PACK standard machine with a chain length of four meters includes the following stations, each of which can be equipped with the AP10S position indicator: the material infeed, into which the blister film is fed via a chain system, is followed by the heating and deep drawing systems, into which the SIKO position indicators can be integrated. Here the film is preheated and deep-drawn with a blister mold that matches the mold stamp – as a positive or negative mold. The product is then inserted, either by hand or fully automatically by means of a pick-and-place unit. Then the cover material, such as cardboard, Tyvek, aluminum, PET or PVC film, is fed in and the whole thing is sealed, either by heat sealing or, optionally, ultrasound sealing. Finally, partial or complete cutting is carried out. Depending on the needs of the customer, additional stations can also be integrated (possible on Z.PACK series with a chain length between five and eleven meters), which can also be equipped with position indicators for size changeover: insertion of leaflets, laser or inkjet printing, blind imprinting on the packaging edge, perforation of cardboard and film, folding of the filled blisters, camera-aided monitoring and scanning of barcodes are all possible. All stations must be adjusted to the new film width on every product change – and this must be done very precisely. Cutting contours for the blister packs must be exact for a perfect product, as must the seal surfaces. The SIKO position indicators play a part in achieving this precision.